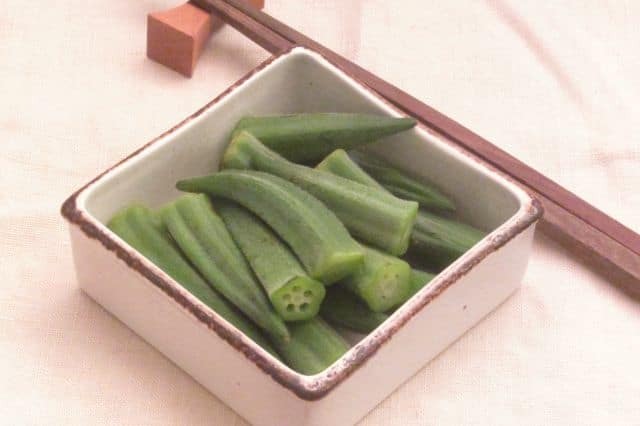 Quickly cook tender, delicious okra whole so that it isn’t slimy! Then – someplace – I came across this technique. A day or two ago I would have told you exactly which cookbook it was in – until I found that it wasn’t… Nor was it in any similar book, or another I got around the same time, or… I suspect I got the idea somewhere, but changed it over the years to my own taste. But anyway – I think it works well. A key factor is having really fresh, delicate young pods. 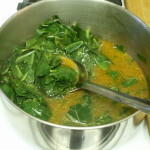 I keep larger or older ones aside to slice for gumbo, or soup… But I can cook the small ones whole. And cooking them whole is the real secret, here! I don’t want water to get in and react with the gel holding the seeds, as that causes the slimy texture. 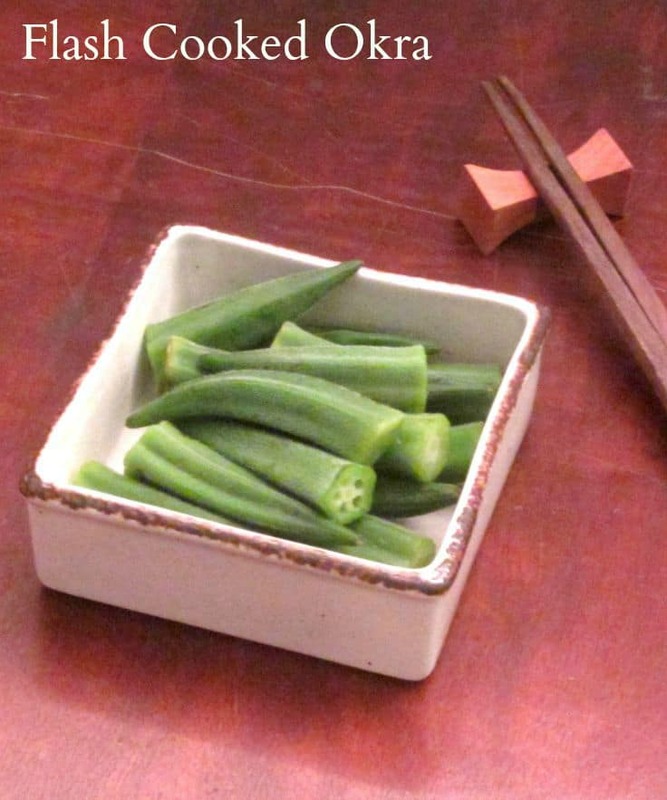 The color will dull slightly after it is cooked, but that bright green is a good indicator that the okra is done. 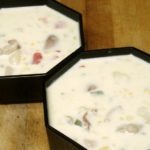 A variation is to season the water, but do remember that if you do so, it may affect the color – in that case, keep a sharp eye on it to be sure you don’t overcook it. I’ve added a little soy sauce, or used a bit of broth… but more often I season it after it is cooked. And there you are. 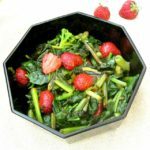 Fast, easy, delicious – and tender, not mushy, stringy or slimy. 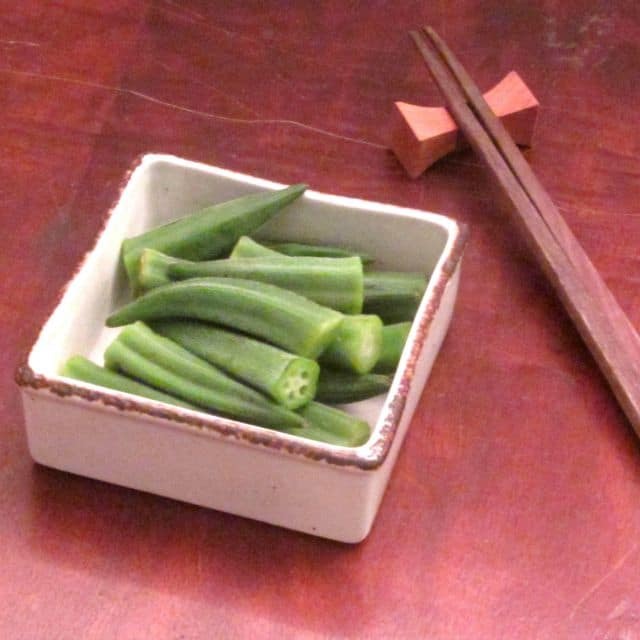 Who knew okra tastes that good, all by itself? 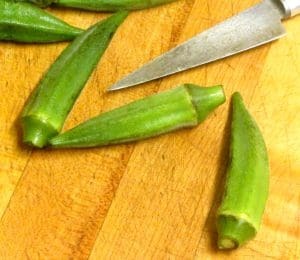 Quickly cook tender, delicious okra whole so that it isn't slimy! Wash okra, and rub with towel in case any pods are getting bristly. Carefully trim off caps, leaving the pod sealed if possible. 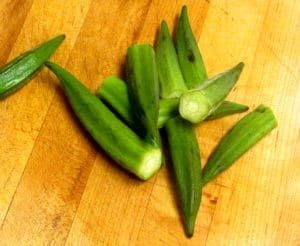 Bring 1/2 inch of water to boil in a fry pan large enough to hold all the okra in a single layer. 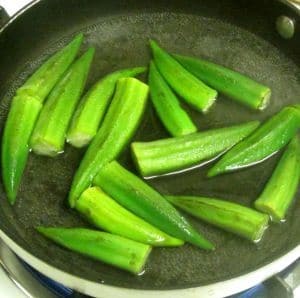 Add the okra to the boiling water, return it to a boil, and boil, turning the okra periodically so that all side cook evenly, for about 5 minutes.